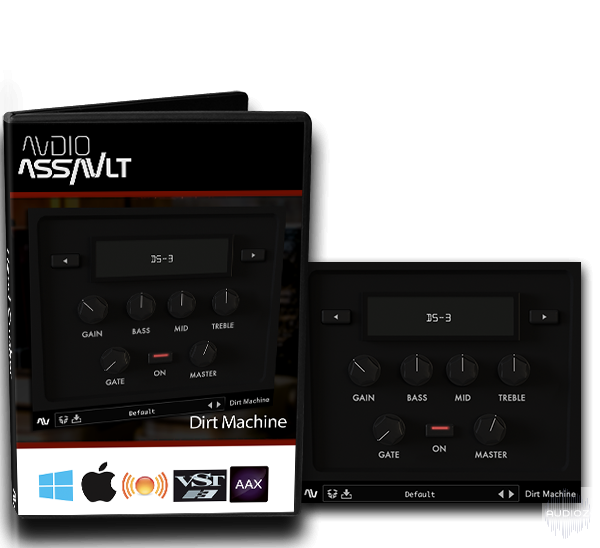 Audio Assault’s “Dirt Machine” is your new favorite distortion pedal plugin! Built on the same engine as our highly acclaimed “Grind Machine II”, “Dirt Machine” gives you all the controls you wish you had on your favorite drive boxes with a no-nonsense workflow! The on board 3 band eq allows you to sculpt your tone to perfection, and the built in noise gate helps eliminate noise issues before they happen! Dirt Machine’s streamlined GUI places all controls at your fingertips in one screen. This keeps you focused on dialing in the right tone, and helps you avoid getting lost in a sea of options. The intuitive layout mimics the familiar workflow of most drive pedals, while remaining intuitive enough to operate in a DAW environment. Dirt Machine’s on board controls provide a familiar workflow for effortless use. Controls for Gain, Bass, Mid, and Treble Each parameter can be automated, allowing for customization and flexibility! Dirt Machine provides a wide variety of stomp box flavors to choose from! + Dead Pony models a boutique pedal that is beloved for focusing your amp’s drive section with another layer of drive to create maximum crunch. + Seoul Food models one of the smoothest overdrives, and all of the subtle dynamic nuances therein! + Acoustic Sim brings the CEO of acoustic simulator pedals to your DAW! + EPic Boost models a discrete FET preamp pedal known for its clean boost and ability to drive the input of any amp. + Huge Muff brings the legendary big furry distortion of the 90’s into your DAW. + Huge Muff Wick with wick lifts the big furry distortion out of the muck and into the air. + Texan Pride is the sound of the lone star state. + Lil Screamer will make sure that everyone hears your tubes scream! + Crayola is the smoothest colorful pedal in your virtual board! + DS-3 is a smooth high-gain distortion in an orange box. + ODC is a 3 letter drive with buttery high-end. + Fuzzbot – A nasty sounding fuzz by designed by us. The Input / Output section features a noise gate, an on/off switch, and a master output volume control. The ON switch bypasses the plugin. The MASTER control sets the output level of the plugin, and has a range of -12db to +12db.